Russia has an ingrained neon Nazi skinhead movement. Attacks on dark-skinned foreigners in Moscow and St. Peters burg have been relatively common in recent years. The members shared ultra-nationalist views, the lawyers added. Ryno had arrived in Moscow in 2006 from Yekaterinburg, and was studying at art college, where he painted orthodox icons. This leaves the strong impression that the skinhead movement continues to grow in Russia, both in its numbers, geographical scope, and viciousness, though some of that may be a matter of perception due to better media coverage of skinhead violence. Harder to measure was the hidden cost of the panic fueled by rumors and memories of skinhead violence during past anniversaries. Obviously, the implications of the state’s reaction, or more accurately,lack of reaction, to skinhead violence are profound, and must be closely monitored. 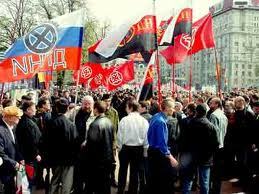 They organized themselves to kill people who came from former Soviet republics in central Asia and the Caucasus regions.If Russian authorities don’t take immediate, serious, and consistent steps to control the skinhead movement, by next April 20, some of these ethnic minority self-defense groups may become radicalized to such an extent that their own national extremists might take them over.